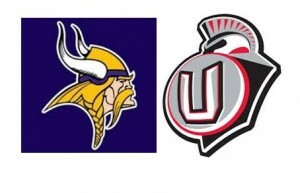 LAST WEEK: Lake Stevens beat Woodinville 28-14; Union beat Puyallup 35-28. ABOUT LAKE STEVENS: Lake Stevens was the 4A Wesco Conference champion. The Vikings reached the championship with a 56-0 win over Kentlake in Week 10, a 56-42 win over Curtis in the state first round and a 45-28 win over Graham-Kapowsin in the quarterfinals before beating Woodlinville. Lake Stevens has outscored opponents by an average of 48-16. Senior quarterback Tre Long has passed for 2,532 yards and 31 touchdowns with just three interceptions. Long also has rushed for 451 yards and 12 touchdowns. Junior Dallas Landeros has rushed for 1,312 yards and 12 touchdowns. Thomas Lewis rushed for 725 yards and 12 touchdowns. Senior Ian Hanson has 54 receptions for 902 yards and nine touchdowns. Junior Kasen Kinchen has 41 catches for 927 yards and 12 touchdowns. Senior defensive lineman Brandyn Roberts leads the team with 152 tackles. Long passed for 127 yards and rushed for 62 yards and two touchdowns against Woodinville. Landeros rushed for 112 yards and one touchdown. Long 45 yard TD pass to Hanson gave Lake Stevens a 20-14 lead with 11 minutes left in the fourth quarter. Landeros’ 9-yard TD run with a minute to go sealed the victory. Lake Stevens’ defense forced three turnovers and held Woodinville to 235 yards of offense. ABOUT UNION: Union was the 4A Greater St. Helens League champion. To reach the championship game, the Titans beat Enumclaw 55-37 in Week 10, beat Skyline 50-10 in the first round of state, beat Bothell 49-35 in the state quarterfinals before beating Puyallup. Union has averaged 47 points a game in the postseason after using its defense to win most of its regular-season game. Senior quarterback Lincoln Victor has been the spark behind the offensive surge in the postseason. After missing 2.5 games with a hip injury at the end of October, Victor has passed for 705 yards in three state-playoff games, completing 42 of 51 passes for seven touchdowns. He has also rushed for 330 yards and four touchdowns over the last three games. For the season, he has passed for 2,171 yards and 20 touchdowns in 10.5 games. He has rushed for 753 yards and 10 touchdowns. Last week, when star player Darien Chase left the game early with an injury, Victor played defense at defensive back. Chase, a University of Nebraska commit, is expected to return to the field for the championship game. Chase has 57 receptions for 869 yards and 13 touchdowns. He was also the defensive player of the year in the 4A GSHL and remains a threat in the return game. Jojo Siofele leads the Titans in rushing with 839 yards and eight touchdowns. He also has 44 receptions for 670 yards and seven touchdowns. Nile Jones has rushed for 685 yards and 12 touchdowns. Junior linebacker Tyler Summers leads the team with 95 tackles. Junior Daron Ulrich has 74 tackles and senior Josh Joo has 71. Josh Barber and Reagan Kelly have 4.5 sacks each. Union coach Rory Rosenback battled against Lake Stevens while coaching at Glacier Peak. PREP PROLETARIAT SAYS: Click here.